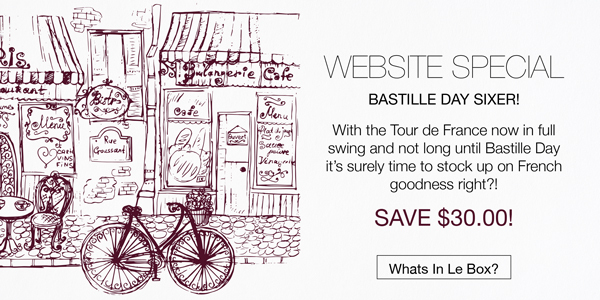 + Bastille day sixer deal! Good afternoon. It looks like we’re in for a bleak few days, so the thought of parking fireside with some tasty vino at hand is pretty attractive! Thankfully, Coombe Farm are in that business (the tasty vino business) and Alan DeKeizer will be here from 5pm today to guide us through a great lineup. Coombe Farm is a pretty small label in the grand scheme of things, and winemaker Nicole Esdaile has been overseeing a sure and steady improvement in wine quality since 2009. The fruit quality has always been first rate, a point not lost on the likes of Mac Forbes and Syd Bradford amongst others, who have been regular purchasers of vineyard manager Xavier Mende’s grapes, and now the Coombe wines are reflecting that standard. Tonight we’ll showcase sparkling Blanc de Blancs, Pinot Gris, Pinot Noir and one of the better Merlots in the Yarra. Make it your biz to get on down!! Click above to check out our website special six-pack to celebrate all things French – Le Tour, Bastille Day, Richard Gasquet at Wimbledon……ok, maybe not Richard Gasquet, but you get the idea! This entry was posted in Splinters and tagged Coombe Farm.